I know there are only thirteen more days of school but I've been wrestling with an idea all year... Can I live without my teacher desk? Several teachers I know have already #ditchedthedesk this year and haven't stop raving about the space and flexibility it provided. I wanted those things too. But I still wanted my own space in my classroom. I don't sit at my desk very much but I felt like I needed a place to enter grades, check over work and keep my supplies. I'll admit, I was way too scared at the beginning of the year to take the leap. My teacher desk was big and spacious and made me feel like a teacher... Plus, it was my space. But alas, last Friday, with only 14 days left of school, I decided to try living life without a desk for just a few days. It would be a trial run. Just a few days to see if I really could completely ditch the desk. I knew I wouldn't have to officially give up my desk (since it can easily roll out into the hallway) and I could see if I could really live the desk free life. Today was my first full day of being desk free. And I realize -- I have space. Glorious much needed floor space! Students commented about being about to stretch out more and we weren't all on top of each other or the massive furniture. My room has so many possibilities by moving Big Bertha to the hallway. I have room for some small end tables or more seating in the library along with room for two more book shelves! once I'm not sure how I'm going to quite utilize the new found space just yet, but I get myself organized, I'll start making some plans. I can't wait to see how one small change will impact my classroom environment. For now, my home base as I'm calling it is at my small group kidney table. 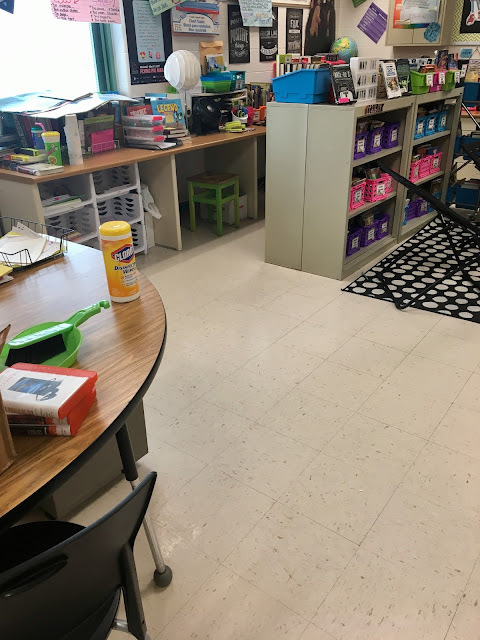 I still have a access to all my supplies and have a space for myself in the classroom. I really wish I would have had the courage sooner. 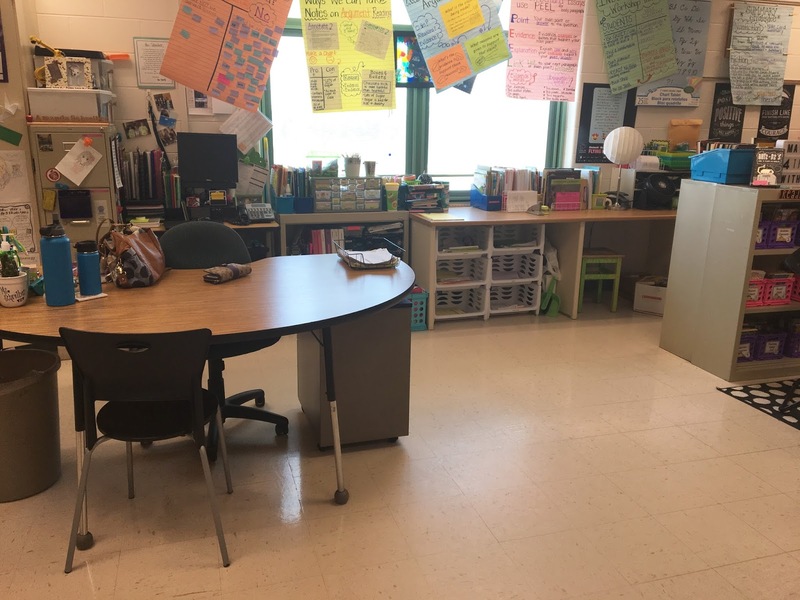 If the notion of getting rid of your desk is even tickling your teacher brain, try it. Do it. It may not work out - and that's okay. But it's so worth giving it a try. I'm not sure why this little change was so hard but I'm glad the desk is ditched.